Kids Create Mobile Apps In the Classroom Some of the best new digital apps are coming from the youngest tech innovators. Middle school students Xavier Manning and Ciara Chase created apps that make their community better: from improving garbage collection to finding missing teens. Guest host Celeste Headlee talk to the students, and their guidance counselor Carletta Hurt. "NPR is in the business of telling stories that start conversations, increase understanding and enrich lives and enliven minds," says Jewell Sparks, CEO and Founder of BiTHouse, a minority tech consulting company in San Francisco. 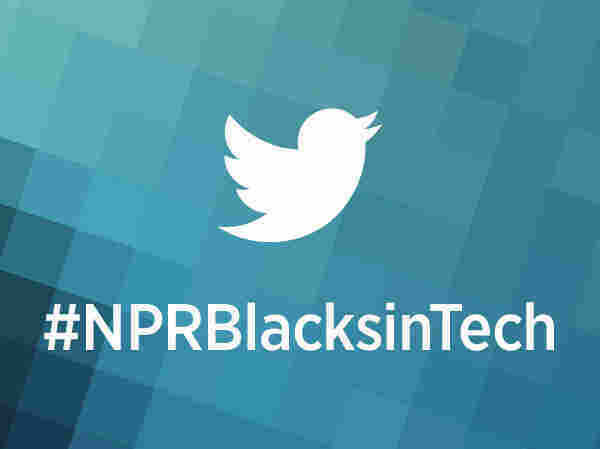 "The @TellMeMoreNPR #NPRBlacksinTech Twitter chats are doing just that, starting conversations that must be had." The conversations are unfolding in a compelling and innate way: each tweet tells a story, every link is a further exploration. This is Tell Me More's first endeavor with this type of social media outreach, and it's revealing something new and surprising each day. So far, the participants have included a hackathon champion from San Francisco; a New Jersey physicist who tweeted about his nanotechnology research; and an entrepreneur in Wisconsin who tweeted about the challenges of building a start-up and the importance of civic tech. Roxann Stafford is a design strategist at global innovation and collaboration firm SecondMuse. She says civic tech is a grassroots movement joining members of government with all members of a community to solve social problems. "It is a public, private, and people partnership accelerated by the ease of connection we have through technology to rapidly design, test, and share ideas. Civic tech addresses issues as diverse as public transit, crime prevention, disaster response, and even employment opportunities for veterans." Some of the tech thinkers are answering questions from seventh and eighth graders from Howard University's Middle School of Mathematics and Science. When asked whether or not apps developed by these students are an example of civic tech Roxann conveyed "Absolutely! These ideas don't have to come from top officials. They can come from throughout. And the ability to recognize, let's say in this situation that there was a need around trash collection and more people to be aware of that, that's a part of that type [civic tech] of dialogue." 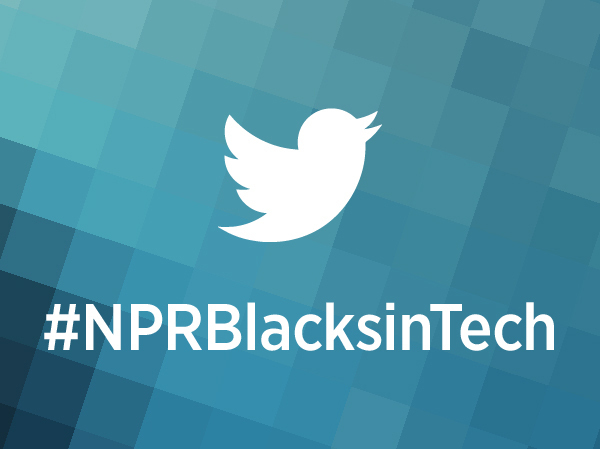 Howard University Middle School students Xavier Manning and Ciara Chase, who created their own apps as part of a class project, joined Guest Host Celeste Headlee, along with their guidance counselor Carletta Hurt, to talk about their work, and other conversations on #NPRBlacksinTech. 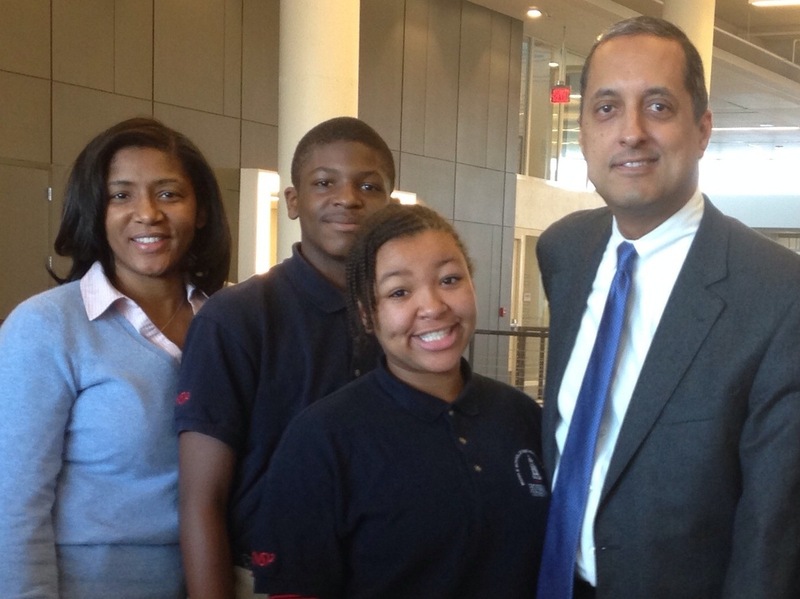 Xavier Manning and Ciara Chase are students at Howard University Middle School of Mathematics and Science. They stopped by NPR with their guidance counselor Carletta Hurt and teacher Patrick Gusman. This post was modified for clarity on December 27th. Xavier Manning: My app is Trash Tracker. So basically, you know how like, usually on Monday morning, how the trash man goes to every house in the area to get the trash? [Celeste Headlee: yeah] And sometimes your trash is not even there, so it just wastes a lot of time for the trash man. So with the app, you basically get to pick a button that says 'If I need my trash taken out.' And if you need your trash taken out, it goes to your address. And if you pick, 'I don't need my trash taken out,' it just skips it, which saves time and takes the worry off your shoulders to make sure you get your trash taken out, because you could press it at any day. Ciara Chase: The name of my app was Minority Matters. And recently, we saw an article published by Jet Magazine, and it stated that every hour, 17 minority children are kidnapped. So for our app, it's basically so a parent can post their child's kidnapping. Because without the app, you have to go through like a lot of police reports or post signs and stuff to find your child. But for the app, if you find that your child is missing, you're able to post it, and anyone that has information about the child is able to comment under the post so they could help you in a faster way. Because usually after three hours, a lot of damage is already done to the child. It's a faster way to help them. Manning: I think that turns more into a bullying asset. Like, say you come into a school, and you like math and science so much. And you see that the kids at your school, like your peers, they don't like it, and they might bully you, like you're a nerd, you're a geek, like some kind of robot or something 'cause you do math so well. That might make you want to be like, 'You know what? Forget math and science. I just want to not be bullied.' So that might turn you away from it. Chase: I would say follow your heart, and like if you have a good idea, don't be scared to hold back. Just like, get it out there and let people know. Manning: I would regret something that I didn't do, as opposed to something I did do. So if you're thinking about doing it, just do it. Try it. At least try it. So if you don't like it, fine, don't like it. But try something else that might work and help you.